I’ve been moving towards a more authentic voice in my preaching. This means I am trying to be the real me from the pulpit by using the same words and phrases that I would use in common conversations with others. Unfortunately, words or phrases that would be experienced as honest, refreshing, maybe even funny, among my friends and colleagues are suddenly heard as edgy or inappropriate when up in a pulpit. So I’m worried about how this will play out—but not worried enough to change my sermon. As long as my mother doesn’t drop by, no harm will be done. Also, I believe the church is in desperate need of a more authentic voice from the pulpit. Then, in my first Chapel Service here at the college I am tackling Mark 7: 24-30 where Jesus refers to a desperate, widowed Syrophoenician woman as a “dog.” This word, kynarion in Greek, translated here as “dog”, was known widely throughout the ancient Middle East as an ethnic slur used by Jews against non-Jews. The word represents the racist, prejudiced, ignorant beliefs of one people over and against another people. So it’s really hard to understand how this offensive word could have rolled off the lips of the Prince of Peace. I’ve decided not to make any excuses for Jesus, though. I don’t think he needs me to protect him. (I also respect him enough to let him be his very own Messiah.) Instead, I am going to be honest about the difficulties in this text and reveal its dangerous nature. I don’t want to be a “play it safe” preacher when it comes to texts like these. do not light up the world they live in…. 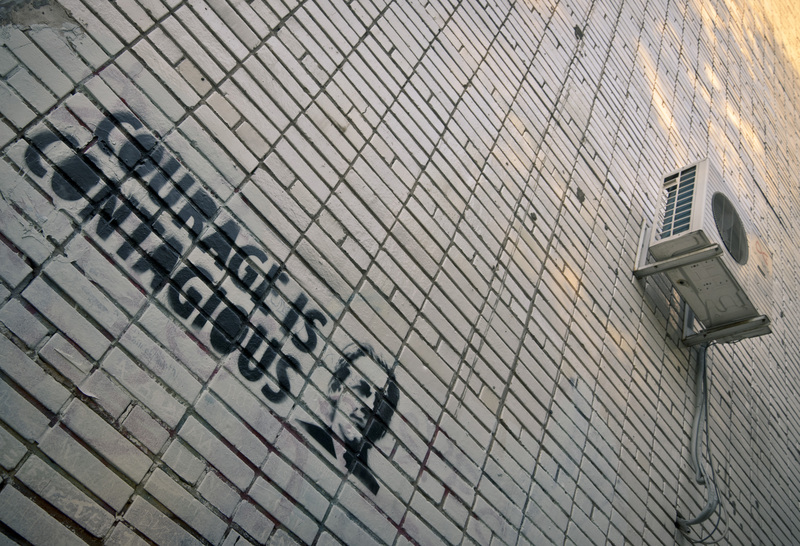 The gospel is courageous and those who proclaim it should be too. I love the quote and will try to remember it when I’m listening to future sermons. You show courage by speaking your truth, even to us older folks who might think it edgy! We need some shaking up! Yeah, the Romero quote is great, with the added benefit of being true! The following falls under the category of advice you didn’t ask for that you probably already knew. Still, saying it helps me remember it. It’s a noble calling, preaching, and you’re pursuing it nobly, Teri. You’re wrestling with the right angels. How does a preacher honor the prophetic imperatives of the call while also delivering the good news? How do I set aside my people-pleasing fear of offending the congregation without indulging the side of me that wants to offend, that wants to rattle cages, to be bold, even ruthless, for the sake of the gospel? I mean, hey, you’re right, it’s jagged and dangerous (especially Mark 7:24-30). There’s going to be collateral damage. My guess is, you’re like me. Because you have a pastor’s heart you’re concerned about alienating those you preach to. So, chances are you won’t. You’ll do the prayerful work of distinguishing between what you want to say and what the people can fruitfully hear. You’ll bring the evangel your called to bring and give it to the people as truthfully as you can, as humbly as you can, tailoring it in the hope that what they receive is the blessing you intend to give. Then if you still piss people off or hurt some feelings, do what Jesus does in the passage you’re preaching. Be open to the possibility of being wrong and adjusting your message going forward. We don’t just preach to the lost sheep of the house of Israel (Matthew’s parallel, 15:24), to those who know what we know and get what we get, we’ve got to leave some crumbs for anyone who’s hungry. Thanks for the encouragement, Dan. I’m also worried about navigating all the foreign Lutheran liturgy! But I know the congregation to be full of gracious people, so I’m sure they won’t mind when I stand up or sit down at the wrong time and muddle my way through communion. Hi Teri, I’ve appreciated your published thoughts – here and last year on Christian Century – about being more real in the pulpit/preaching. What you say resonates and leaves me wanting to ask you more questions. If/when you have time to chat some, would you email or pm me on Facebook? Looking forward to more conversation eventually. I’d love to chat, Deborah! I’ll pm you soon so we can set up a time.